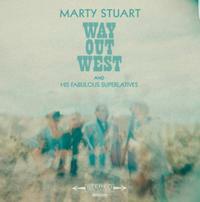 Five time Grammy-winner Marty Stuart returns with Way Out West, his 18th studio album, on March 10 on Superlatone. The album was conceived as a love letter by one of country music's living legends, whom has played with everyone from Cash to Lester Flatt, to the lonely but magical American West, specifically the promised land of California. "If you go and sit by yourself in the middle of the Mojave Desert at sundown and you're still the same person the next morning when the sun comes up, I'd be greatly surprised," says Stuart. "It is that spirit world of the West that enchants me." Listeners can feel the warmth of those desert winds over the album's 15 tracks, a collection of newly-written originals, instrumentals and rare covers. Produced by Mike Campbell (Tom Petty and the Heartbreakers), and featuring the Fabulous Superlatives — guitarist Kenny Vaughan, drummer Harry Stinson and new member, bassist Chris Scruggs — Marty's longtime band, which NPR Music said could "melt your heart with four-part harmonies, rock your bones with honky tonk, and dazzle you with picking worthy of their name," Way Out West is a cinematic tour-de-force. Marty Stuart is a five time Grammy-winner, platinum recording artist, Lifetime Achievement Award recipient from the Americana Music Association, Grand Ole Opry star, country music archivist, photographer, musician, and songwriter. Since starting out singing gospel as a child, Stuart has spent more than four decades celebrating American roots music. His teenage years on tour with bluegrass legend Lester Flatt in the '70s were followed by six years in Johnny Cash's band in the '80s, and a chart-topping tenure as a solo artist in the '90s. Stuart hosts a Late Night Jam at The Ryman, a yearly tradition which kicks off the CMA Music Festival, with recent guests including Dolly Parton, Jerry Lee Lewis, Neko Case, Eric Church, Chris Stapleton, Maren Morris, Dan Auerbach and many more.